Were last months leaves, just too much fun or what? Thanks Amy for a quick and easy way to start our our BOM. Oh deer, it looks like Carla is bringing us adorable wildlife this month! Are these two, just the cutest? Amy at Sew Incredibly Crazy is our fabulous host. in this adventure, that promises to be a fun romp in the woods! The first of every month we will share a new block with you. It will be free for the duration of that month. After that, there will be a small charge for each block. and has links for each of the blocks. 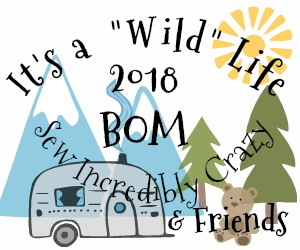 Come join us for this years wild adventure. 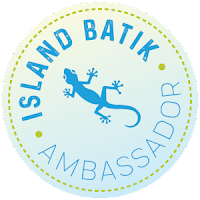 I'm proud to tell you that "Island Batik" is sponsoring me again this year. basic, blender and neutral line. Something that is always in stock! That way you can always find more of these fabrics. finished with a project and not being able to find more. These are the beauties they sent for this BOM. I can hardly wait to cut into them all. 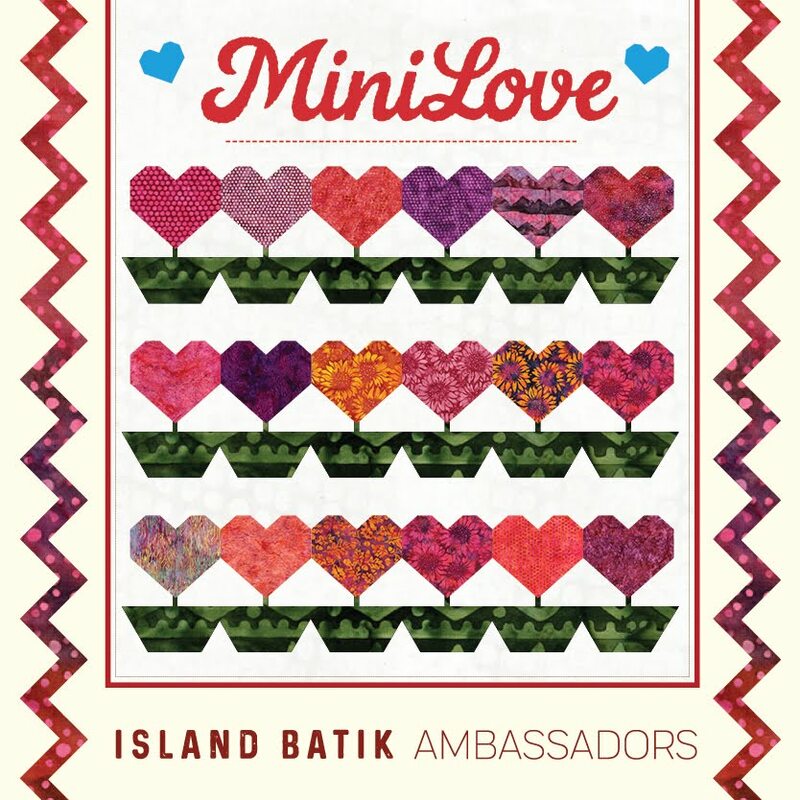 Thank you "sew" very much, Island Batik! SEW...what are you waiting for? So much so, that I have my quilt club gals hooked on them too. When Deb's mom visited us one day, we sat her down and had her sew some up. made us all acrylic templates, to make marking easier. They even personalized them for us! 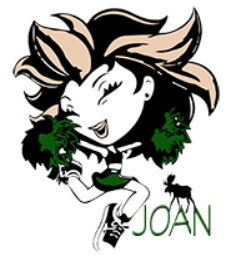 This is just the coolest thing! No more measuring for us now. Thanks Dorothy and Lucas. We knew we could lure you into our Quilt Club trap! I love collecting fun prints for these bowl holders. We have started putting them into our sewing bags. They make the best thread catchers. 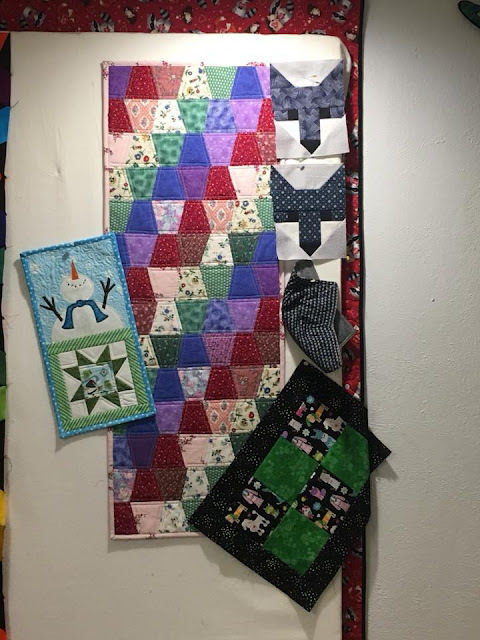 I have to brag a bit about our "Flying Quilters" gang. They are just so much fun. It's kind of amazing that we get anything done, for the laughing we do. My design wall was out the other day and they took full advantage of it. It was a treasure trove of memories for Dorothy who gave her the scraps. 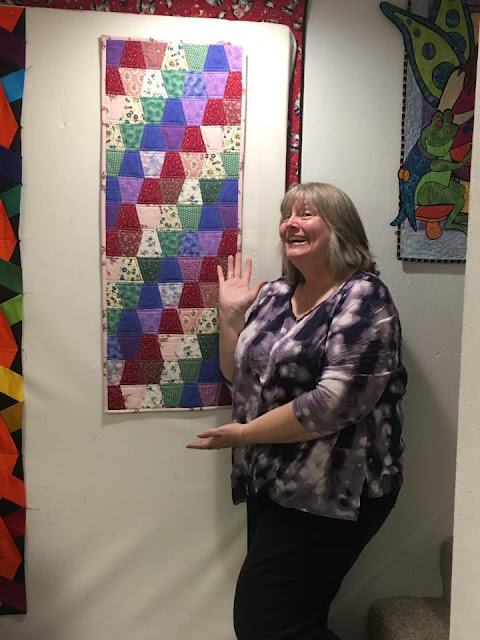 That's what quilting is all about! By the end of the day our wall was filling up with finishes. 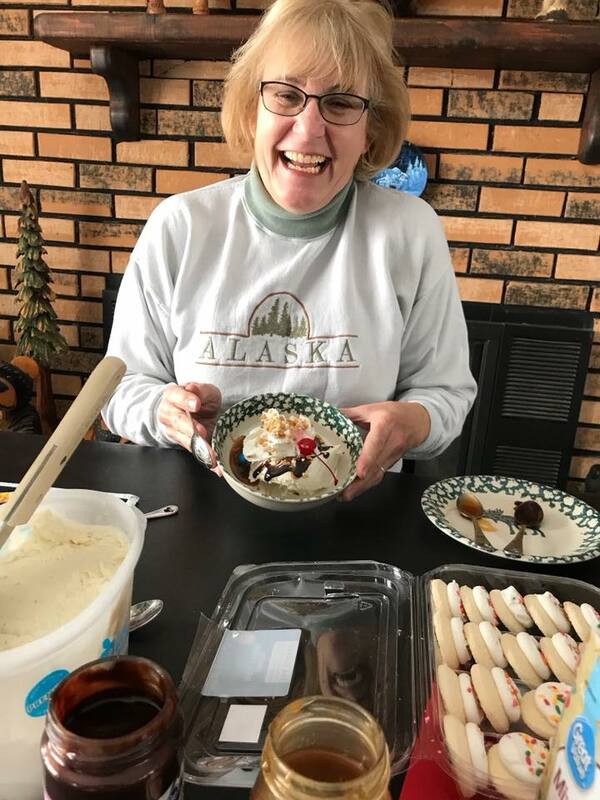 It was 10 degrees outside and I decided to have an ice cream sundae bar! With all the bowl holders I have...I didn't use one for my sundae? Guess I'm going to have to go shopping for ice cream fabric next! Remember our "Put A Little Love" blog hop a couple of weeks ago? This was my project, and Carol our fearless leader loved it so much she ordered the pattern. She commented on her order, that she had seen mine and fell in love. 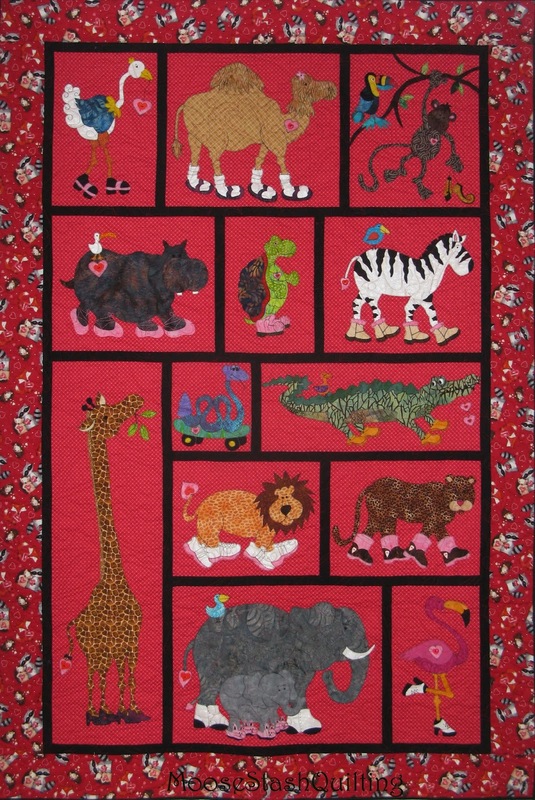 Your blog came to our attention through Carol Swift when she order the Jungle Walk for a Cause pattern after seeing your beautiful version on your blog. Once patterns leave here we don't always get to see the end results of our designs. Your version of Jungle Walk is so different from our original and many others we have seen. The red background really makes a statement. We would love to be able to upload these photos to our gallery on our website and want to give credit where credit is due. 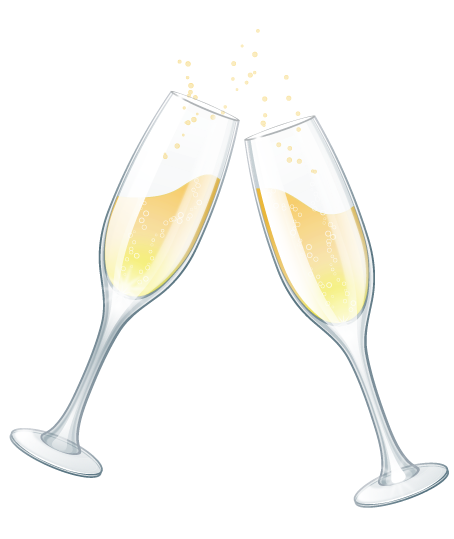 So we are writing to ask your person to share your photos and all your great sayings with our clients. For me, there is just no bigger compliment. Thanks Trisha and Mary, you girls have no idea just how much you made my day. There's a moose in a row boat that's just calling my name! Sending you all loads of "LOVE" today. I'm in love with these Island Batik fabrics. They are fabulous fabric to work with, and the colors, oh my. It's heavy on the inspiration, and light on the thighs. And that's a conversation I'll have with myself another day! 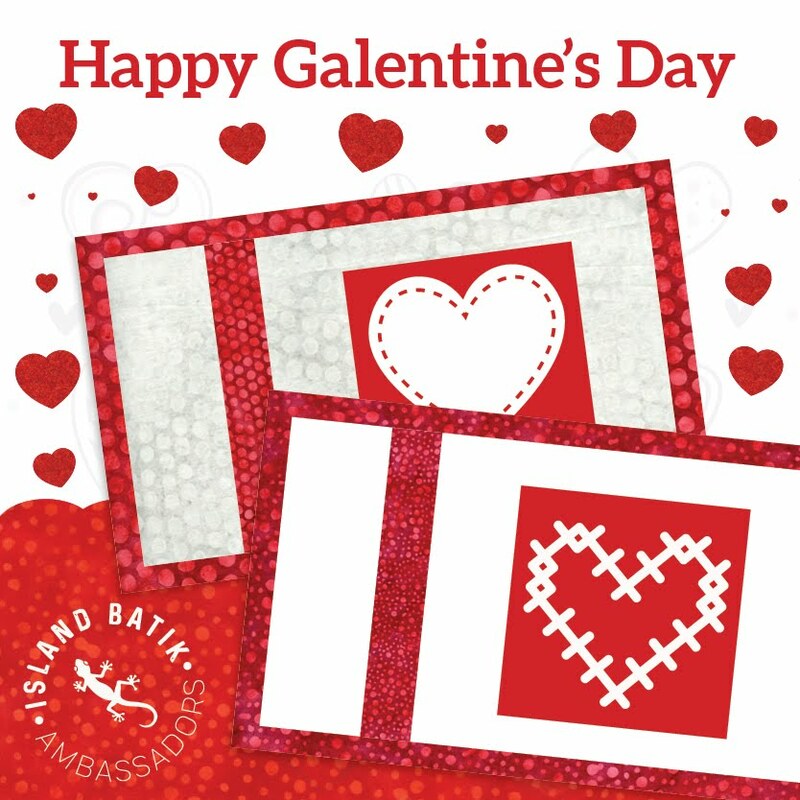 A day to celebrate with your gal pals! The first of the Ambassador challenges, have begun. 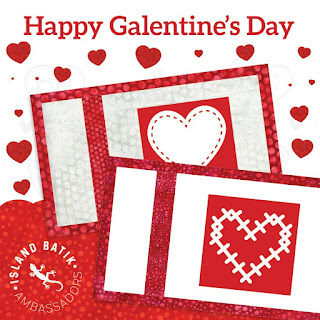 with a challenge to make a "Galentine's" Day mug rug or post card. Here's my "Love Letter" mugrug. This pattern is from Angies Bits 'N Pieces. I've long been a fan of her wonderful applique patterns. For us to share a bottle of wine and some truffles over. Oh, oh...my secret is out! Yes, my gal pals love a little bit of vino from time to time. Enjoy it with your gal pal! Remember these adorable little snow hearts that Bunny Hill Designs shared a few years back? to get those patterns off their computers and do something with them. that got me to thinking. I've been sitting on those patterns here, too. The blue one is January...I was a month behind now. February is pink of course! These Aussie girls really do fabulous embroidery. I just don't have that knack. 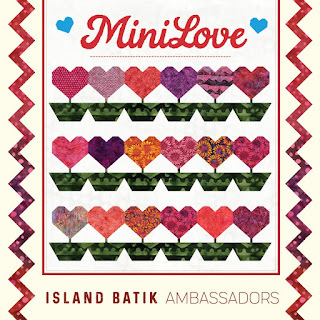 My hearts are felt, and batik. The snowmen are made from batting scraps. so that's coming out and going thru a re-do of some kind. I'm so glad I took them apart and finished the edges differently. Each so very different and fabulous! Be sure to check out January's hearts, when you visit them. How many of you have these patterns sitting in your computer too? We are going to post our hearts the second Monday of each month. That's Australia time, here in the US, that would be on Sunday. Anybody want to join in with us???? Now I'm off to fix my hearts! Forget it, it didn't happen here. Actually I gained 22 pounds. but for me, it's a great thing! Not for my thighs of course, but for my fabric diet! box of new fabrics and goodies on my steps! With this being my 3rd year as an ambassador for "Island Batik"
this time they were "BIG" boxes! With a surprise tucked inside. Do they know how to spoil us! New lines of fabrics, and goodies galore. We gonna have some fun this year! A big thanks goes out to "Hobbs" batting and "Auriful" thread for their addition to our boxes. I've long been a fan of "Hobbs" battings, and "Thermore" in particular. It's a very thin polyester batting that quilts up perfectly flat. I hang quilts of every size and there is not a wave in site, when I use "Theremore" batting. Ask my Quilt Club gals about the case of Thermore batting I bought at Quilt Festival! it wasn't pretty, but I got it to the hotel. Just for the record, it's not a legal carryon size with the airlines either! Nothing pieces as nicely as "Aurifil". I've tried them all, and the proof is in the pudding as they say! your not going to want to miss a one. 12 months of inspiration is coming your way. Yes, I broke right into those wonderful fabrics! Thanks Carol for challenging us to all "Put a Little Love"
in our projects this month! Mine has a double scoop of "love" in it. was designed as a comfort quilt for cancer patients and survivors. These silly little critters are bound to lift any ones spirits a bit. Roller skates on an Ostrich! Can you just see someone you know, in socks and sandals? You've got to know some kid who would hang from a tree and taunt you! A hippo in ballet slippers??? A turtle in work boots. A Zebra in UGGs...in any ski area I'm sure. and every snake should skateboard! But a Crocodile in crocs??? in cowboy boots. Heaven knows everyone else in town was. Whether it's spats or bunny slippers... Every elephant should have em. And every Flamingo should have high heel saddle shoes! There's a little pink heart in each block. Something for everyone to "love" on. I recently posted HERE about my new labels from the "Dutch Label Shop". and they will make it into a label for you. because they want to help you "Put a Little Love in Your Quilts" too. 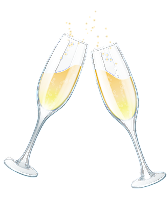 is offering a 15% discount to my readers for the next 60 days. That's plenty of time for you to dream up your special label. Come back and share them with me. I want to see what fun labels you have created. I do hope you have enjoyed this hop as much as I have. Make sure you haven't missed, a one of these "heartfelt" posts. Happy Valentines day to all! My your find your day filled with "Love"